As many have heard through the grapevine, director Dan is proud to welcome newest member of the Eclipse family. 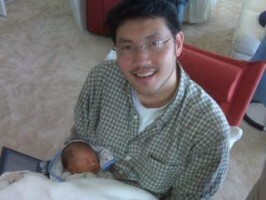 His baby boy Zachary Zhang was born on Apr. 12th, at 6 pounds and 9 ounces, 20 inches tall. He is thankful for all the congrats and has new found appreciation of all parents. He’ll look to get Zach started early on his setting hands. This entry was posted on Sunday, April 18th, 2010 at 4:49 pm	and is filed under Uncategorized. You can follow any responses to this entry through the RSS 2.0 feed. You can leave a response, or trackback from your own site.